Pace University’s New York City Model UN program is planning to help cover the costs of between eight and 15 students (depending on the number of eligible applicants and costs of flights) who wish to attend the prestigious Geneva International Model United Nations (GIMUN) conference, held at the UN’s Palais des Nations in Geneva, Switzerland, 21-29 March 2014. The conference will be held in simultaneously in both English and French. 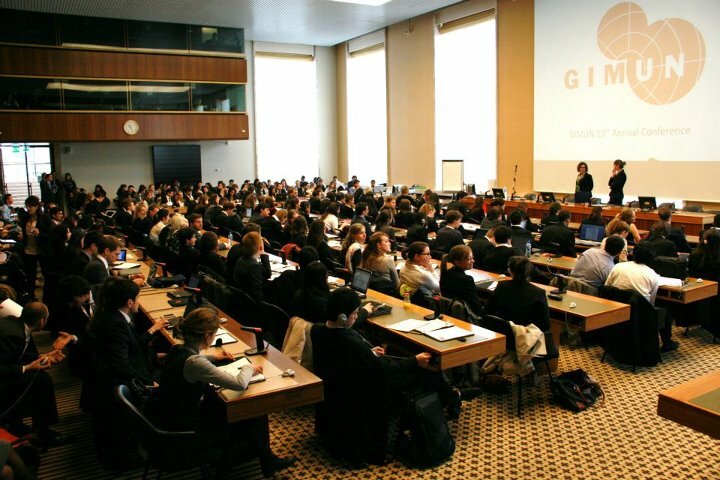 Unlike with most Model UN conferences, GIMUN “accepts individual delegates and not delegations” – students can apply to participate as Delegates. Pace Model UN students will travel together and stay together with the MUN faculty advisor, Dr. Matthew Bolton. However, they will participate in their own delegations, not necessarily alongside other Pace students. Pending final approval from the administration, Pace University will cover much of the cost of participation, including conference fees, flights and internal transportation and housing. However, participants accepted to go on the trip will need to make a contribution of around $400-500 (exact amount to be determined), plus any passport, visa, medical or vaccination costs you need to be able to travel and your own food and entertainment costs. You will need to complete an application to the Pace NYC MUN program, which will include a draft of your application to GIMUN by 25 November at midnight at the latest (late submissions will not be accepted). If you are approved by Pace NYC MUN program, then you will need to submit your application directly to GIMUN by 6 December (you alone will be responsible for making sure this is completed and will need to forward the application receipt to Dr. Bolton). To download an the application, click here. Note that there are eligibility restrictions on this opportunity, so please read through the document carefully. Also note that no late applications will be accepted. This entry was posted in Uncategorized and tagged application, Geneva International Model United Nations, GIMUN, Model UN, Model United Nations, MUN, Pace University. Bookmark the permalink.